This is my first time using your platform from the organizer side, and I can't say enough about how easy it is. You've done a fine job. Thank you so much. By the way. I feel your website has changed the sport of racing sail boats. I go on all the time to see how friends are doing in other regattas. It's like following your Favorite sport teams. Enjoy the day! "And on the larger scale, Yacht Scoring has been, and is, a great service to the Sport of Sailing, providing benefit to the competing sailors and event managers and the clubs. You have made racing sailboats better!" The BVI Spring Regatta, which takes place in the turquoise waters of the picturesque Sir Francis Drakes Channel, has thrived on innovations. Five years after the event started in 1972, innovations began. In 1977 officials moved away from destination racing coupled with a series of parties on different islands, and introduced round the mark and more formal racing. "It was a pleasure working with u for our Discover the Caribbean Series Regatta here in Ponce. Starting to use it one week before the regatta made us very, very nervous but everybody was amazed with how easy your program was to use. I think that we only used 15% of its potential. trust me for 2013 we are going to start using it very early so we can use it to it's full potential. Thanks for being available whenever we needed you." "Thank you so much for providing such a wonderful service for us to use for our Annual Wirth M. Munroe Fort Lauderdale to Palm Beach Yacht Race. Your website is so easy to use and makes planning and scoring so simple and efficient. I also think that the publicity on your site helped promote our event and it showed! We had 36 entries this year! Thank you so much!" I have significant experience with Yacht Scoring as both a competitor using the system and as a race organizer, where Luiz and his system were used to basically run our whole event. I have been involved in organizing and/or managing well in excess of fifty regattas over the years and Yacht Scoring is the best system I have yet encountered. Luiz is a racer and event organizer himself and he understands what is needed by competitors and race organizers alike. He is actively involved and any issues are dealt with promptly and courteously. I would not think of running an event now without employing the Yacht Scoring system. Thanks for all your help this weekend! The program is as awesome as it is simple... an outstanding combination. I can't imagine running a major event without it. St.Thomas Yacht Club's 33rd annual International Rolex Regatta which concluded March 26th has been declared by sailors, race officials and Rolex Executives to be the "best Rolex Regatta ever!" The event was greatly enhanced by the first ever use of Interactive Creations' (www.intercreate.com) unique Yacht Scoring program. With Yacht Scoring we were able to transmit race results directly from the finish line to the web site (www.yachtscoring.com) to the International Rolex Regatta web site (www.rolexcupregatta.com) and all results could be viewed in near real time in the clubhouse. Preliminary race results were printed and ready for distribution before the sailors hit the dock. 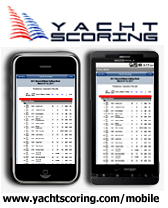 The 'Yacht Scoring' program includes a registration interface which centralized and simplified the process. It tracks each phase of the registration process until it is complete. This scoring program propelled the International Rolex Regatta into Yacht Racing Cyberspace and continued the tradition of innovation which has been the trade mark of the Regatta. Sperry Top-Sider Charleston Race Week has been using Yacht Scoring now for six years. Both of us have evolved and grown significantly together over the few years. The applications Luiz has added to his program makes its easier to communicate and manage an event than ever before. I joke that its like Excel we only use a the tip of the iceberg. Any event can improve the racers experience by its use. We have been impressed by the ease of online entry and communications with competitors. Post the Preliminary Scratch Sheet early and get the feedback from competitors way ahead of the event. Post an amendment or announcement and with one or two clicks, all the entrants are notified. Chester Race Week has also invested in Yacht Scoring, a web­ based, race management and scoring system used by some of the competitive sailing world's top organizations. The benefits of the system include real­time on-line scoring and communication with skippers and crews before, during and after each race via email notice. However, official notices will continue to come from race committee boats via traditional flag and horn signals. "This year each skipper, crew member and family member on shore will be able to get their boat's exact finish time and ranking via their smart phone before the start of the next race. ­ It'll be hours faster and more accurate than it used to be," said said 2014 principal race officer Elizabeth Shaw in a release. "If we have to delay a start due to wind or weather, the race committee boat will still communicate changes to the fleet with traditional signal flags, but skippers and tacticians are going to love the convenience and speed of the new Yacht Scoring email notices delivering the same updates, faster." Chester Race Week 2014 served up a perfect combination of good wind, first class racing, superior race management and excellent shoreside hospitality — looking forward to 2015. "All in all, Chester Race Week 2014 was an incredible event. There were a lot of standout moments over the past few days in weather and competition, and sailors were mentally and physically pushed to their limits,” said Shaw. “Our new web-based regatta management system, Yacht Scoring, delivered results faster and more accurately than ever before." Once again Yacht Scoring proved to be an invaluable tool for running our regatta. We had an incident which required us to reach an emergency contact for one of our sailors before that sailor was in from the water. The Yacht Scoring system is so comprehensive that we were able to access that information in an emergency situation with the click of a button. Great system!